In addition to the thousands of channels available in the Roku Channel Store, you may have heard about something called private Roku channels (now called "non-certified channels" by Roku, Inc.). Private channels are like any other Roku channel, except that they aren't listed in the channel store and Roku Support won't help you if you have problems with them. There are a number of reasons why a channel may be private: It may be a beta version that isn't fully developed or tested, it may be directed to a very limited audience, or it may contain adult content and therefore not be eligible for listing in the channel store under Roku's terms of service. Because they aren't listed in the channel store, you'll need a channel code to install a private channel. If you browse our private Roku channel directory you'll find the code listed with our review of each channel. Private channels can only be added through the Roku website. Sign into your Roku account, then go to my.roku.com/account/add. Alternatively, log in and select My account from the dropdown menu under the welcome button; under Manage Account you will find a link to Add channel with a code. Once you're on the "add channel" page, enter the channel access code, and select "Add Channel". Each listing in our private channel directory also includes an "add channel" link that takes you to this same location and fills in the channel code for you. At this point, you may get an error that "the channel code is not associated with a valid channel." 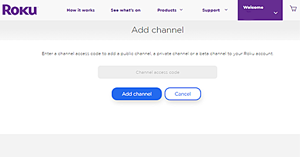 Private channels tend to come and go, so if this happens and you entered the correct code, then the developer has abandoned that channel or has updated the code to allow access to a newer version of the channel. If the code is valid, you'll be greeted with an ominous warning that you're installing a non-certified channel, that you may be exposed to offensive content, and that Roku may remove the channel without notice. The only part of the warning with any substance is that you may be blocked from adding additional private (non-certified) channels if the channel you install has content that violates copyright restrictions or otherwise violates Roku's terms of service. If you're not knowingly adding a channel with pirated content, you don't need to worry about this warning, and can click the OK button to proceed. If you're still concerned about the warning, read About Roku's Non-Certified Channel Warning at the end of this article. Once you see the channel logo and name, click the "Yes, add channel" button. But you're not done yet - to access the channel immediately, you will need to refresh your channels on your Roku device by going to Settings > System update or Settings > Player info and checking for an update. If you don't do this, the channel should show up following your Roku's next automatic daily update. As noted above, private channels tend to come and go and quality varies greatly. None are officially supported by Roku, so don't bother calling Roku tech support if you have problems with a private channel. Roku private channels have often been used a means to steam pirated videos and to distribute video streams without the consent of the copyright holders. Two examples are the now-defunct Nick Reboot and Cartoon Network Reboot channels that streamed popular Nickelodeon and Cartoon Network shows until copyright holder Viacom sued the channel developer in 2015 for copyright infringement, trademark infringement, cybersquatting, and unfair competition. At that time, Roku, Inc. had a passive stance on copyright infringement, assuming that channel developers had the rights to content on the channels they created until a copyright violation complaint was filed by the copyright owner. This approach culminated in mid-2017 when Mexico banned the sale of Roku devices in that country due to pirates illegally selling streaming access to TV channels. Roku was also getting set to go public and didn't want their IPO threatened by bad press over video piracy. Roku began taking a more proactive approach to policing private channels and removed other channels, including the popular XTV channel, which streamed live cable channels, TV shows, and movies without the copyright holders' consent. THIS IS A NON-CERTIFIED CHANNEL. Roku requires all channels to abide by Roku’s terms and conditions, and to distribute only legal content. Roku does not test or review non-certified channels. You acknowledge you are accessing a non-certified channel that may include content that is offensive or inappropriate for some audiences. Moreover, if Roku determines that this channel violates copyright, contains illegal content, or otherwise violates Roku’s terms and conditions, then ROKU MAY REMOVE THIS CHANNEL WITHOUT PRIOR NOTICE, AND YOUR ACCOUNT MAY BE BLOCKED FROM ADDING ANY OTHER NON-CERTIFIED CHANNELS. Despite the ominous-sounding language, don't let this warning scare you away from adding private/non-certified channels. You're just accepting that you may be offended by the content, Roku won't provide technical support if the channel doesn't work, and Roku may remove the channel. Nothing new there. The only part of this warning that carries any weight is that your account may be blocked from adding any more private channels if you add a channel with pirated or illegal content or otherwise violates Roku's TOS. Is that something you should worry about? Probably not, unless you repeatedly add channels with pirated content. I have yet to hear any reports of anyone being banned from adding private/non-certified channels, and the warning is likely aimed at those who are knowingly skirting Roku's TOS. For example, if a developer creates a channel with pirated content that gets shut down and then repeatedly relaunches the same channel under new channel codes, you could potentially get banned from adding private/non-certified channels if you keep adding the new channels that you know have been previously removed for copyright infringement. For the average Roku user who adds channels from our private channel directory, the risk of losing this privilege is low. At RokuGuide.com, we don't list private channels offering content that is obviously pirated, so you should be safe as long as you aren't getting codes from sites that actively promote the distribution of pirated material. And if we get any feedback that people are, in fact, getting banned from adding private/non-certified channels as a result of unwittingly adding a pirate channel, we'll change our recommendation. (This article was originally published on January 4, 2014, and has been updated to reflect Roku's new policy to call them "non-certified channels."